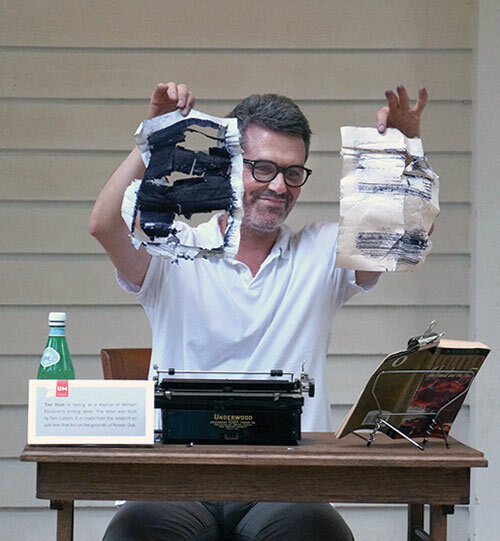 Performance artist Tim Youd came to Rowan Oak this summer and typed William Faulkner’s The Sound and the Fury. During his time at Rowan Oak, Tim greeted visitors and answered questions concerning his goal to type 100 American novels in places of historical significance to the novel or the author. 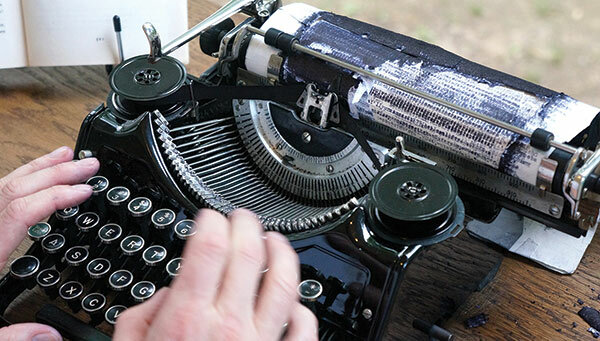 Tim types on the same make and model of typewriter that the author used, and while at Rowan Oak, he typed on an Underwood Portable model. In order to make the experience more unique and meaningful for Tim, a replica of William Faulkner’s desk was made by local craftsman, Tom Lutken. The Friends of the Museum threw a mint julep party on the east lawn of Rowan Oak after Youd’s performance was complete. It was a memorable event that everyone enjoyed. You can learn more about Tim Youd, and his inspiring project by visiting his website. The lower garden renovation, funded by Evelyn and Michael Jefcoat, is nearly complete. The original concrete slab was replaced and the upper brick section was restored since the last newsletter. An erosional gulley has been corrected and the improved water flow should ensure the renovation will last. The project needs final landscaping touches, which will probably be planted in the spring. Some steps may be necessary to reach the lower garden safely. Overall, the renovation went very smoothly. Denny Buchannon from the University of Mississippi’s Physical Plant helped in arranging materials, workmen and a fine landscape architect named Andy Renyolds. Many of you may remember his father, Ole Miss Geology professor, Dr. Bill Renyolds, who used to be on the Museum’s board. Please come and enjoy the lower garden when you next visit Rowan Oak. Rowan Oak is fortunate to have Elizabeth Trollinger as a graduate assistant this semester. Elizabeth and student worker, Marya Paolillo are working hard to complete an inventory of the books at Rowan Oak. 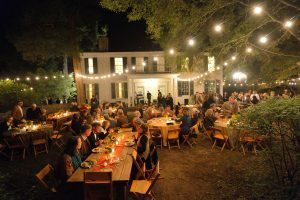 Ole Miss graduate students Sarah and Andrew Thomas, Henry Wise, Sarah Altenhoff, Ryan Charlton and John Lee Thomas help Rowan Oak flourish as one of the best tourist attractions in Oxford. We couldn’t do what we do without them. We are very thankful for their superb efforts. Eagle Scout candidate Luke Kelly is hard at work improving our beloved Bailey’s Woods trail. His Eagle Scout project is to improve signage, fix and maintain a few problem areas, and plan and install an activity to be completed while walking the trail. It is surprising how many people use the trail and these improvements will go a long way in helping them enjoy their time in the little big woods that the Faulkner family loved so much. Long time Rowan Oak advocate and craftsman, Tom Lukten, is supervising Luke and we wish him the best of luck on his ambitious plan. Did you know that William Faulkner was also a Scout Master in the 1920’s? It is nice to see the tradition continue.